Why Should Your Site Have a Spanish Subdomain? Before you even consider expensive localization projects or international expansions, ask yourself this question: Can I grow my audience without expanding internationally? Of course you can. You can sell to the same zip codes and dramatically increase your customer base. 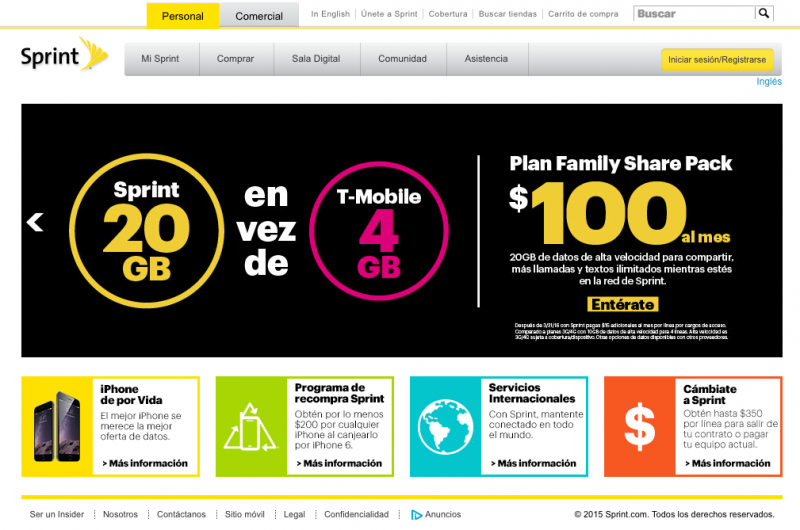 Indeed that’s why companies like Sprint have fully translated their websites to Spanish while serving the same zip codes. But why would a national brand do such a thing? It’s all about network effects. You see, the USA is a multilingual country, and a substantial fabric of its population speaks Spanish. While most citizens are bilingual many understand faster in Spanish, making the impact of ads, copy and SEO relevance much higher. In doing this you increase the reach of your website and the comprehension of its offers but you also gain thousands of free visitors. Google will pick up your pages in Spanish and present them to thousand of hispanics that are looking for the products and services you offer in their mother tongue. Usually, low quality blogs write about your products in Spanish and then send the customers to your site to gain referral commission fees. By creating a Spanish subdomain (espanol.yoursite.com) you’ll be picking up these customers while saving on millions you currently pay in commissions. Like Canada, the USA is a multilingual nation. It is up to us to reach our customers in the best way possible and, nothing makes more economic sense than reaching hispanics in Spanish.